The stories concern three loosely linked characters in the mountains of eastern Tennessee circa 1920s. John Wesley Rattner, a young teenage boy; Marion Sylder, a bootlegger; and Uncle Ather Ownby, a cantankerous old coot stubbornly fighting the progress of modern life. Their stories are only loosely linked via a coincidence: Though none know any of the others’ involvement, Sylder murders Rattner’s father, and only Ather knows the pit where the decomposing body is located (though not the identity of the victim). The setting of the Tennessee town of Red Branch and its surrounding wooded hills is as much a character as those who inhabit it. And as the story unfolds between the characters, a conflict also emerges between nature and man’s encroachment on it. The beautifully rendered land is scarred with various manmade pocks: an ominous government “tank,” which Uncle Ather uses for target practice; the pit where the senior Rattner’s body lies, etc. And there are moments when nature seems to actively fight back, as when Sylder’s car slides off the road and crashes into the woods, and another memorable incident in which a bar’s crowded porch collapses and slides into a ravine. In these moments, the human vs nature duel is nearly literal. This is Cormac McCarthy’s first novel. 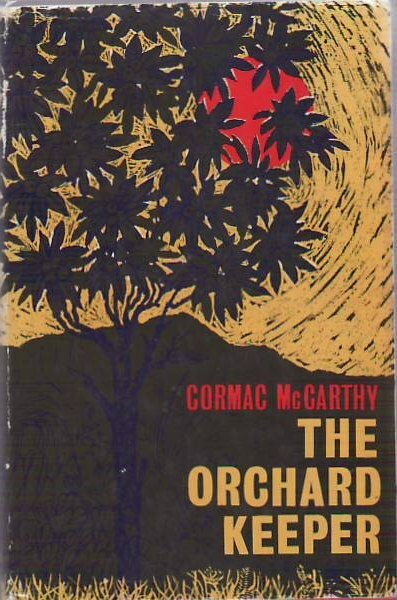 Like most McCarthy fans who read The Orchard Keeper, I found my way to it late, getting into McCarthy through his more recent, more popular works. That’s probably the best way to go, I think. I wouldn’t recommend starting here, because although it’s good, it’s more interesting in the way it foreshadows his later works. The three main characters clearly establish McCarthy archetypes he explores in later novels. Thematically, in McCarthy’s signature mix of humor and the macabre, and in his always vibrant and fecund language, this novel most closely resembles Suttree, one of my favorites. Although I wouldn’t recommend starting here, there is, as always, much to enjoy.